Since most programmers switch to other languages it would be easier to just start programming in these other languages. OK: Sourcecodes are in many cases not useful at all... So now you are exactly saying what I was saying. OO doesn't make all sourcecode useful all of a sudden. So here (once again) there are no benefits to 'force' novice users to start coding in OO straight away. And these beginners will produce great Basic sources, I am sure. That's not the point. It matters how much they understand of it. If you show my mother a JAVA listing she'll run away screaming. If you show her a BASIC listing she might just say 'hmm, that part actually makes sense to me. Maybe I could do that too'. And that's just the effect a novice-programming language should have. Well, our current government shows that the majority of the people isn't always right... It isn't always wrong either. Okeej. But throwing in some examples in some OO language to show basic is shorter will not convince me. I wasn't proving BASIC listings are shorter, I was proving they are more understandable. Well, even beginners will eventually understand what's happening and why it has to be done. The eventually is the problem. Most people don't take that time, they want to see results straight away. And that's exactly what BASIC gives them. And that might just give them the motivation to take their coding skills to another level sooner or later. I can assure you that there wouldn't have been so many cool demo's, tools and games on the MSX created by 'amateurs' if it hadn't been for MSX-BASIC to give all MSX coders a good start. For a beginning programmer, a procedural language (like BASIC, Pascal, C) just *is* easier to grasp than an object-oriented language. After all, when programming, it's easier to understand you're "just trying to *do* stuff" than to understand that you're "manipulating objects". Lesson 1 in object orientation is very difficult indeed: Everything is a object. And it's almost impossible to say you're " just trying to *do* stuff with objects". If the one-chip-MSX came with Intent running MSXPLAYer... would it be good enough to you? No. With intent all basic-functioality including a web-browser, C++ and JAVA compilers, 2D, 3D and video streaming capabilities and a nice audio system are already there. It still all depends on what the NewMSX will look like. Will it be a homecomputer, or more a pda/gba/whateverportable? Will it have a Hard disk (or whatever way to get fast access to much data), and so on. I'm not looking for a organizer with mp3 player or a polyphonic ringbell-system. (OK, I had a few laughs about the intent 2 whitepapers)... The Intent approach also has quite some MSX feel to it. 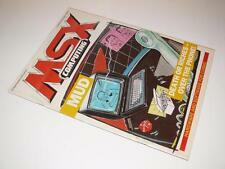 Brandable, platform independant, open documentation.... What's platform independant about MSX? I hope NewMSX won't become just another virtual machine specification. And uhm, I haven't seen the open documentation yet. I will have another look for that. And the one-chip-msx, wasn't that supposed to be a msx on one chip. so put your msx-engine, z80, psg, and what-else-not in one chip? I don't see much use for that. A good working emulator is enough. A real msx even better. I don't think anybody is waiting for yet another OO language. A one-chip-msx IS a real MSX. It has always been the intention to integrate a complete MSX system on one chip. The MSX-Engine chips are a step towards that. You're not making much sense with first saying you don't see much use for a MSX system on a chip, and then saying you prefer a real msx over an emulator. I don't think anybody is waiting for yet another OO language. No, yet another basic, that is what the people want... (And yet another computer system... ) A one-chip-msx IS a real MSX. It has always been the intention to integrate a complete MSX system on one chip. The MSX-Engine chips are a step towards that. They should have made that one-chip-msx 15 years ago, then. You're not making much sense with first saying you don't see much use for a MSX system on a chip, and then saying you prefer a real msx over an emulator. I don't see a need for a one-chip-msx that is the same as a 15 year old msx. And prefering a real msx over an emulator has nothing to do with msx-system-on-a-chip. Try to re-read what I say before stating I don't make sense. Try to cut down on the LSD man... Yeah, I am trying. But it is so hard. No one understands me. Yeah, I am trying. But it is so hard. No one understands me. Maybe that's because you're jumping from topic to topic all the time. We were discussing Intent and potential programming language, then you start commenting tbe one-chip-MSX design/ideas. It makes no sense. - In Nishi's lecture in Tilburg, 2001, Nishi admitted he wanted the MSX2 computer to be a one-chip computer. Unfortunately it was not possible at the time, which resulted in a fight between Nishi and Hitachi. Big mistake afterwards, Nishi admits. - The new one-chip-MSX will be backwards compatible with older MSX computers (at least MSX1, MSX2, MSX2+, probably turboR as well) but will have a lot more BANG for your bucks than just that. We're probably not talking 'PDA', 'Smartphone', 'Homecomputer' or 'Personal Computer' here, but euhm.. something in between. I guess. But definately NOT just an MSX2 on one chip. - One of the problems with 'modern electronic devices' (computers/PDA's) is they do not offer the users the possibility to start coding on an easy, low level, well protected environment like BASIC. I think it would be very nice to see a new, improved BASIC on the new MSX. I could go on, but I'm afraid you'll have quite some strange reactions to these statements already, so lets just take a few things at a time, shall we? Maybe that's because you're jumping from topic to topic all the time. We were discussing Intent and potential programming language, then you start commenting tbe one-chip-MSX design/ideas. It makes no sense. That's why I took two posts for that (one for the programming language/one for the onechipmsx). And reading the whitepaper I sort of get the idea Intent implies Java as language, which should be a mistake. But you seem to agree on that one. But... pay attention, you might learn something Don't worry about that. - In Nishi's lecture in Tilburg, 2001, Nishi admitted he wanted the MSX2 computer to be a one-chip computer. Unfortunately it was not possible at the time, which resulted in a fight between Nishi and Hitachi. Big mistake afterwards, Nishi admits. Nishi & Toshiba had a fight. Or not? - The new one-chip-MSX will be backwards compatible with older MSX computers (at least MSX1, MSX2, MSX2+, probably turboR as well) but will have a lot more BANG for your bucks than just that. We're probably not talking 'PDA', 'Smartphone', 'Homecomputer' or 'Personal Computer' here, but euhm.. something in between. I guess. But definately NOT just an MSX2 on one chip. Probably a one-chip-computer capable of emulating a MSX, but how compatibility is accomplised doesn't matter much. I don't see any reason to not include TurboR. And indeed. 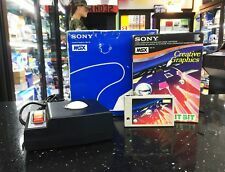 the new MSX should be a real personal computer. But we need another term for that. Any suggestions?